The 1950s and 1960s were a transformative phase in modern Irish history. In these years, a conservative society dominated by the Catholic Church, and a state which was inward-looking and distrustful of novelty, gradually opened up to fresh ideas. This book considers this change. It explores how the intellectual movement Tuairim ('opinion' in Irish), was at the vanguard of the challenge to orthodoxy and conservatism. Tuairim contributed to debates on issues as diverse as Northern Ireland, the economy, politics, education, childcare and censorship. The society established branches throughout Ireland, including Belfast, and in London. It produced frequent critical publications and boasted a membership that included the future Taoiseach, Dr Garret FitzGerald. Tuairim occupied a unique position within contemporary debates on Ireland's present and future. This book is concerned with its role in the modernisation of Ireland. In so doing it also addresses topics of continued relevance for the Ireland of today, including the Northern Ireland Peace Process and the institutional care of children. 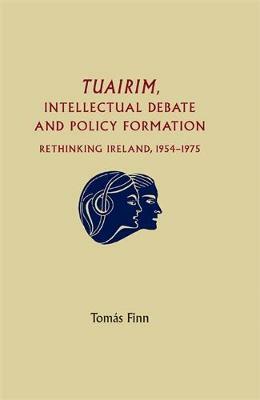 "Finn's documentation of the development of Tuarim adds to our understanding of the fifties and sixties" (Bryan Fanning; University College Dublin, Studies; Volume 102; No 406) "Meticulously researched, well-written and engaging - this is a book for all of us, a book that places issues to the fore and reforms ideas about the role of the 1950s in Irish historiography" [Sarah-Anne Buckley, The Journal of the Galway and Archeological Society' Volume 65: 2013, p. 154] 'This study is welcome for its retrieval of an important group in the making of contemporary Irish society and for the questions it asks about the role of ideas and how they inform or influence the public and policy makers.' Brian Girvin, University of Glasgow -- .